Thanksgiving is over but that certainly does not mean that Pumpkin Pie season is over. This year, we celebrated Thanksgiving with friends and instead of turkey, made Fondue Chinoise, a holiday tradition in my husband’s family. This is a meat fondue where you cook individual slices of meat in hot broth and then dip into one of many yummy sauces. Typically Fondue Chinoise is served with veal and pork and the sauces usually involve cream. We changed things up a little by adding chicken, fish and shrimp and making a couple of sauces that I could eat. We had a mediterranean sauce, a South Indian sauce that was essentially coconut chutney, and a homemade mayonnaise with freshly ground black mustard among others. After a three hour feast and plenty of wine, there was still the apple crumble my friend made to look forward to. Did I mention I love thanksgiving! So the next day, we had planned on eating lightly. However, I had a hankering for pumpkin pie. 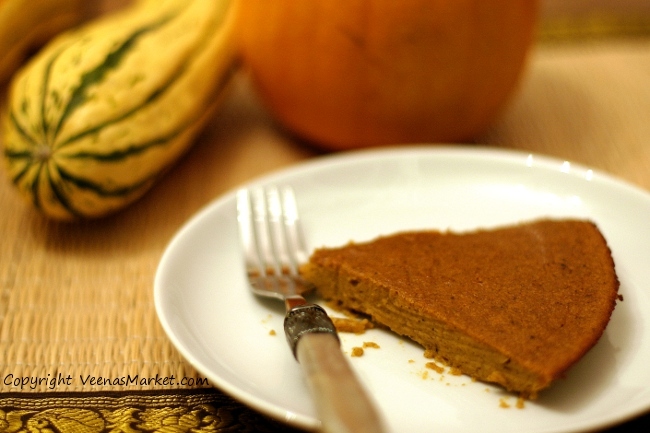 After some research and finding this pumpkin pie recipe, we gave it a try. It was soft, spicy and just made my day. The fact that the pie didn’t have a crust bothered me slightly but it also meant that it was much less work. It was already quite dark by the time the pie was baked and we just had pie for dinner! And unfortunately it was too dark to get any decent pictures. One of these days, I’ll get around to experimenting with a gluten and dairy free crust that I can eat. 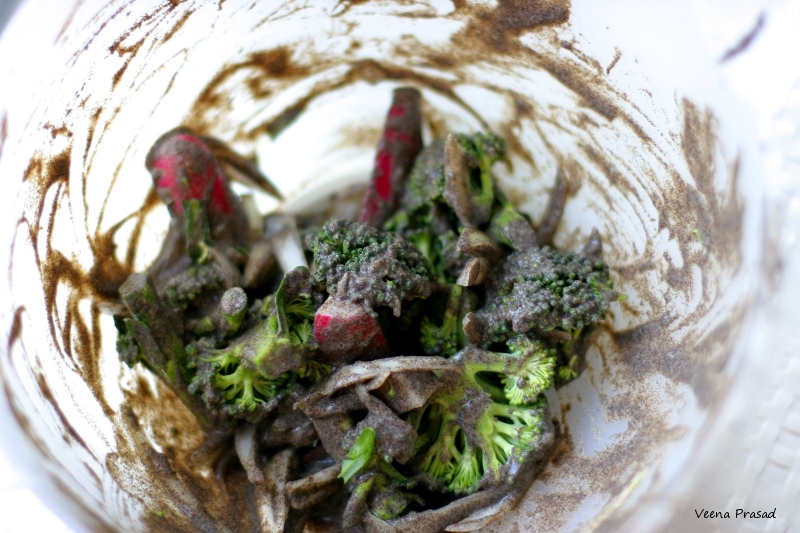 In the meantime, I wanted to share this recipe, bad pictures and all, as soon as possible especially with those of you who, like me, have a lot of food allergies. Life is so much better when you can eat pumpkin pie! Pumpkin pie that I can eat! Preheat the oven to 450 degrees Fahrenheit. Grease a 9 inch pie dish with oil (or butter if you can eat it). Mix together all the ingredients and pour into the pie dish. Bake for 15 minutes and then reduce the heat to 350 degrees. Bake for another 25-30 minutes or till a toothpick inserted into the center comes out clean. *I used regular table sugar or sucrose since I can handle it in small quantities. Please note that I don’t like my desserts too sweet and vastly reduced the amount of sugar used. I’ll be reducing the sugar to 1/4 cup the next time I bake this pie. For those on a FODMAP diet, you can try substituting with dextrose or glucose. 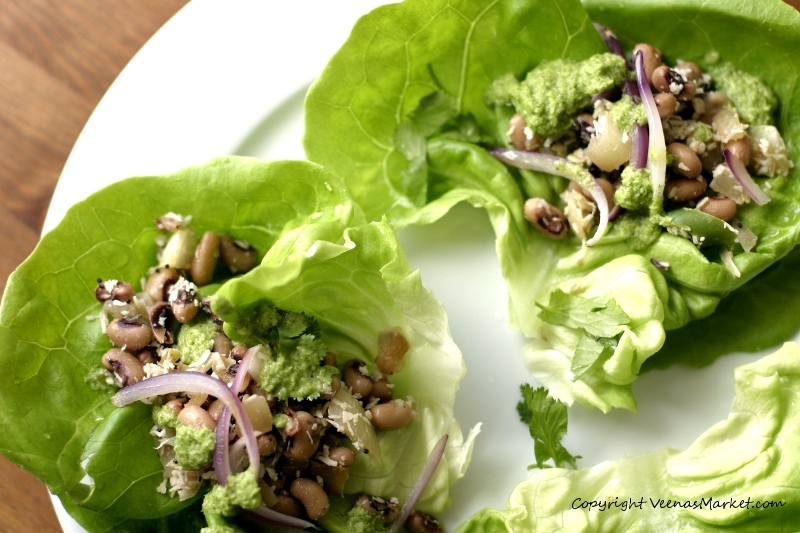 I’ve been complaining about my food allergies on this blog these last few months! 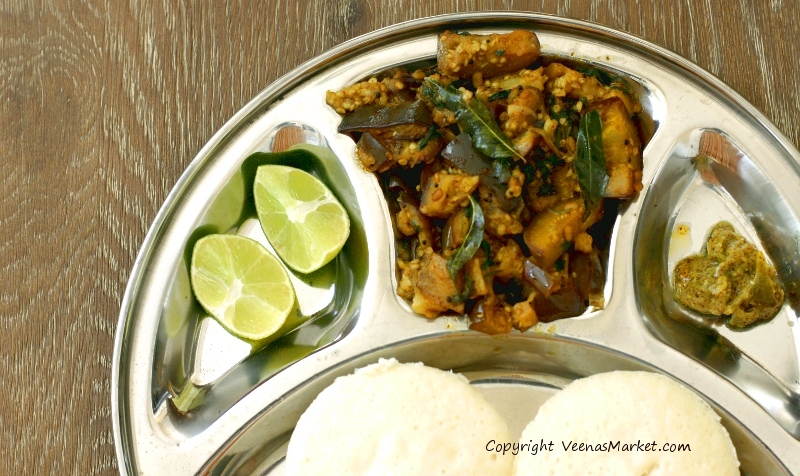 It’s definitely been a challenge to keep cooking traditional Indian dishes at home that I can blog about. With every new addition to my list of food issues, I went through each of these phases: disbelief that you can’t eat that food, despair as to how you’re ever going to do without it, kitchen clean up where I get rid of all the offending ingredients and subsequent trip to the grocery store to stack up on things that I can eat, experimentation with new recipes and finally, finally feeling like it’s not that big a deal any more. Dairy (with the exception of ghee), all soy products, gluten, lima beans, kidney beans, chickpeas, peanuts, honey, corn syrup, agave, most artificial sugars, most vinegars, coconut, apples, pear, cherries, watermelon, figs, mango, avocado, nectarines, plums, prunes, bananas, cabbage, green beans, onions, shallots, garlic, beetroot, asparagus, artichoke, leek, spring onion, radicchio, chicory, and tomatoes. So you can imagine my excitement when I saw this butternut squash dip recipe my friend Alli had posted! 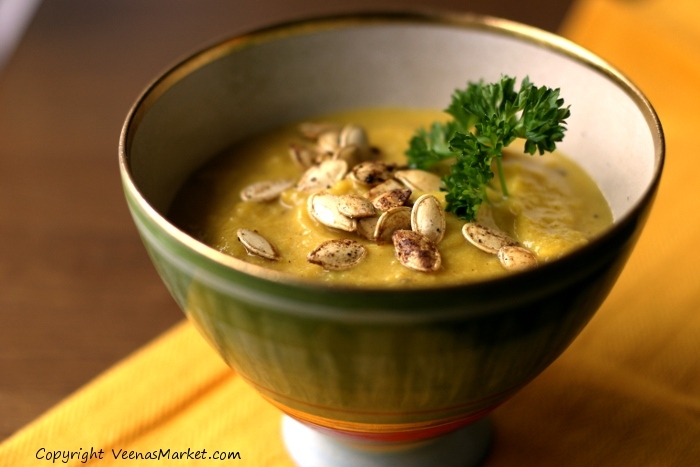 It was seasonal, spicy and different from other pumpkin or squash soups. I had to make a few adjustments of course including leaving out the yogurt. If I could do coconut milk, I would have loved to use that as a replacement. 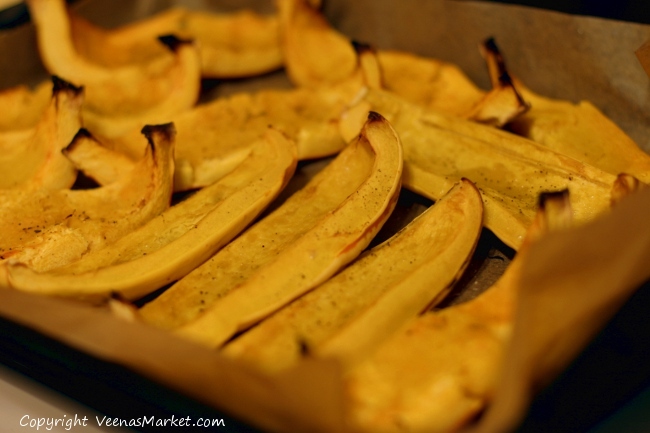 I had a delicata squash and a small pumpkin at home that needed to get used up. I also had a jar of tahini that I hadn’t done very much with. Alli’s recipe not only inspired me to make a spicy squash/pumpkin soup but I loved the way she combines the butter with tahini and spices. I microwaved tahini, ghee (instead of butter), cinnamon, cayenne and salt together. This on its own is a great dip by the way! 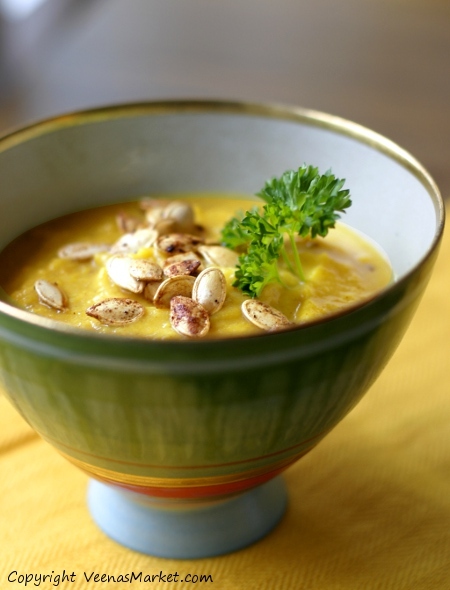 But it adds a wonderful depth to the dish that you don’t get with just the typical squash and cream soup. 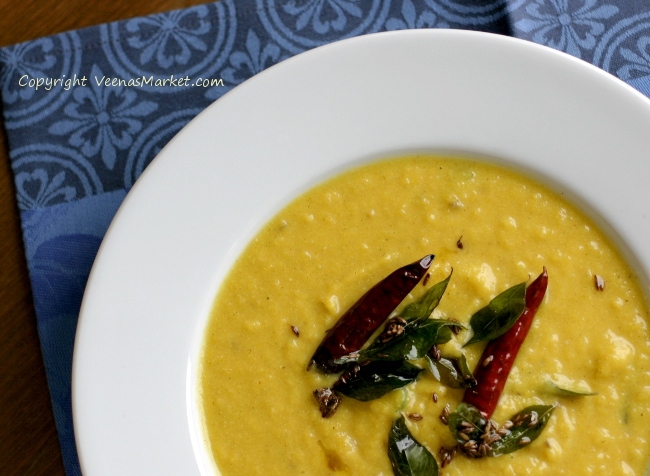 I remade Alli’s recipe into this dish below (scroll down for the recipe) but came up with another really simple idea for curried squash puree that I will share next week! A hint, it’s made South Indian style. 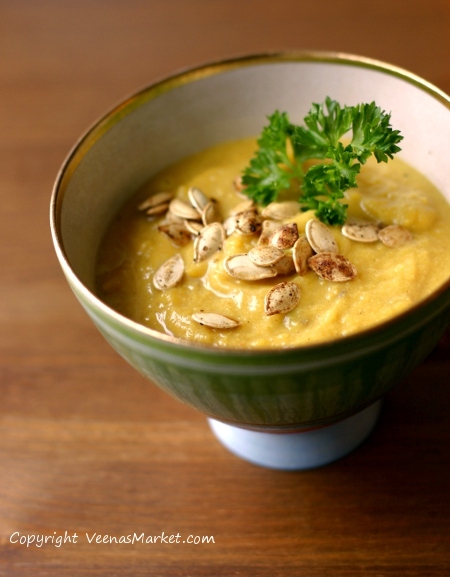 Puree the roasted squash and pumpkin in a food processor with some water.Mix the remaining ingredients in a bowl and microwave for 1-2 minutes on medium high power. Fold into the puree. Adjust for salt if necessary. I had to add another 1/2 glass of water to thin out the soup to my desired consistency. I think I could have easily doubled the amount of garam masala. *Bonus: Rinse and pat dry the seeds from the squash and pumpkin. 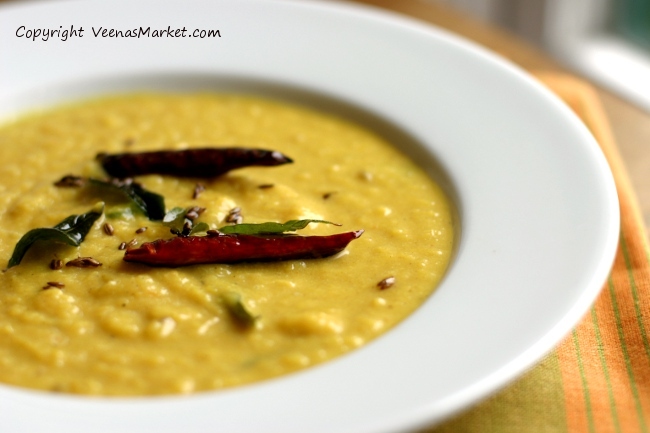 Toss with olive oil, 2 pinches of salt and garam masala. Roast in the oven (lowered heat to 300) for 10 minutes. Allow to cool down before eating. 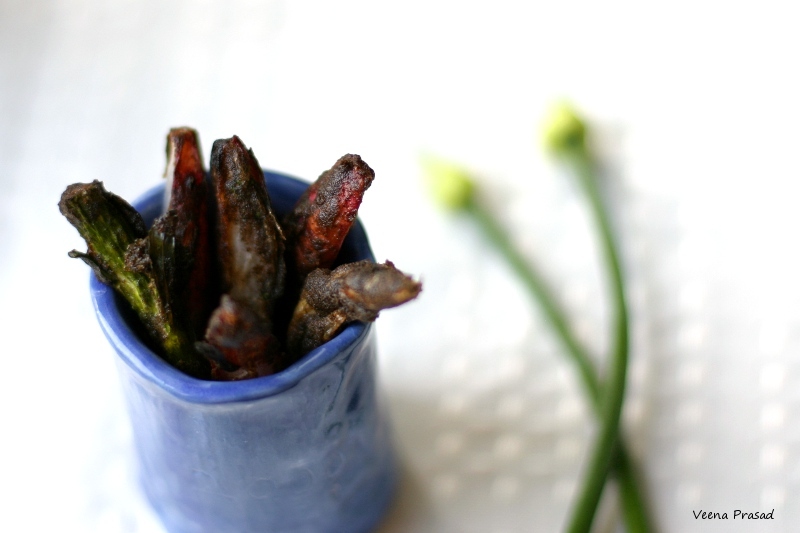 These roasted seeds are great as a garnish or on their own as a snack. If you like pumpkin beer, I’m sure these will pair really well. 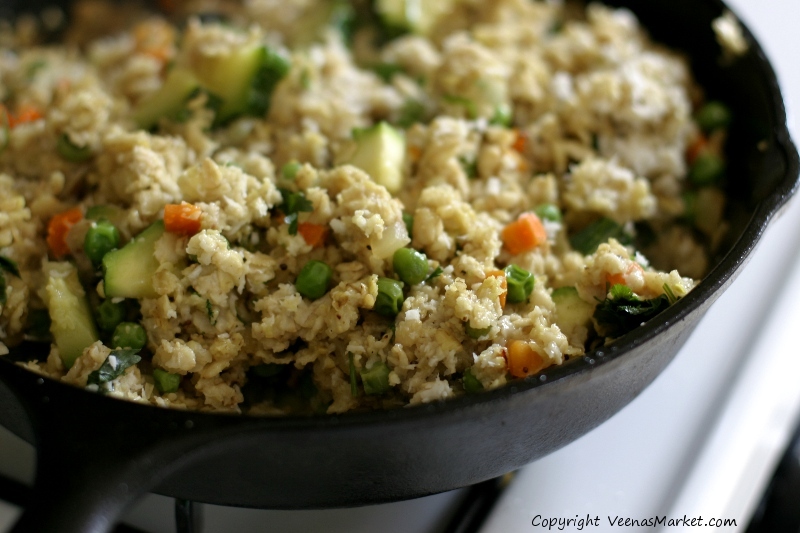 Upma with zucchini, peas and carrots, perfect for a savory breakfast or lunch. 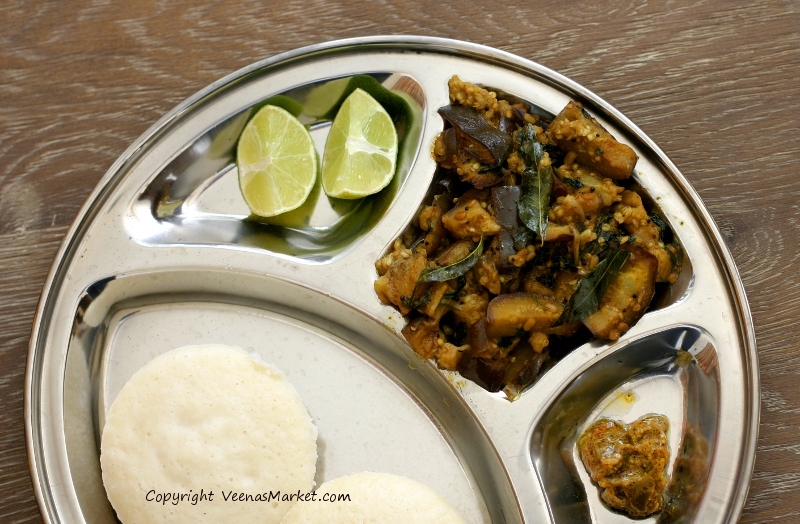 Back when I wrote the post on Upma – South Indian Soul Food, I didn’t have to worry about gluten. 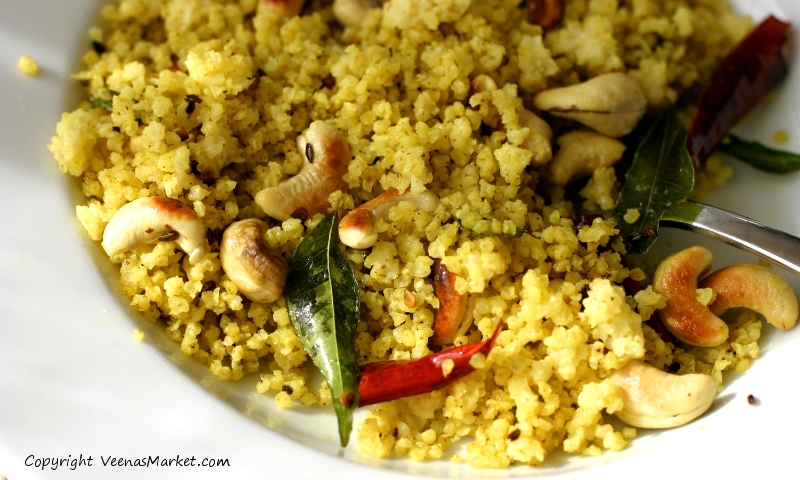 Upma is made from semolina, a durum wheat product. In the last few months, I’ve made upma with broken rice or gluten free cereal blends. They were good but not quite as satisfying. Today I made upma with gluten free rolled oats. It was still different from the original but highly satisfying and elicited a sigh of contentment from me. Upma is a dish in which the final consistency is important. It can’t be too mushy or too dry. While you can use any oats, the rolled oats resists getting too soft and soggy, a problem with quick cooking oats. You might have noticed that I’ve been using a lot of Bob’s Red Mill products. If you’re wondering, no I don’t have any affiliation. I like that they are certified gluten free and are readily available in the stores where I normally shop. Since I was in a hurry and was out of big pots, I modified the Upma recipe. For simplicity, here’s the modified recipe. 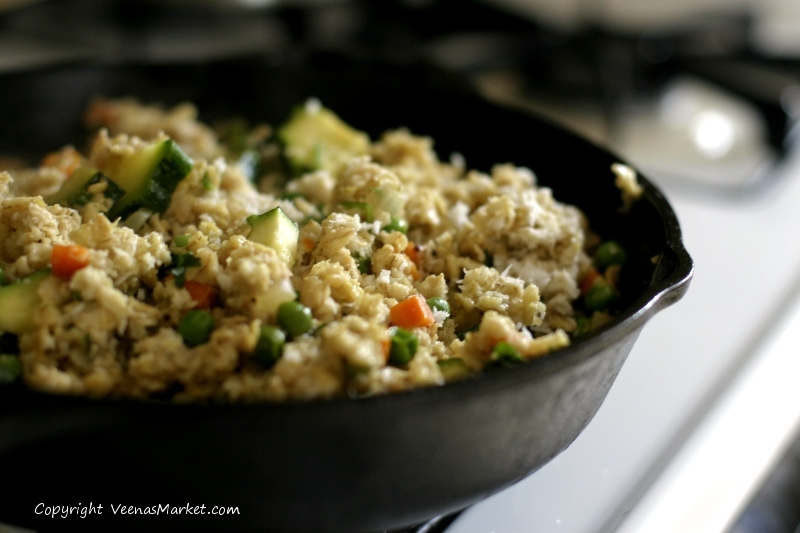 Heat the oil in a large skillet (should hold the oats and the water) over medium heat. You know the oil is hot if you drop in a mustard seed and it sizzles. Add the mustard seeds and wait 5 seconds or till they start crackling. 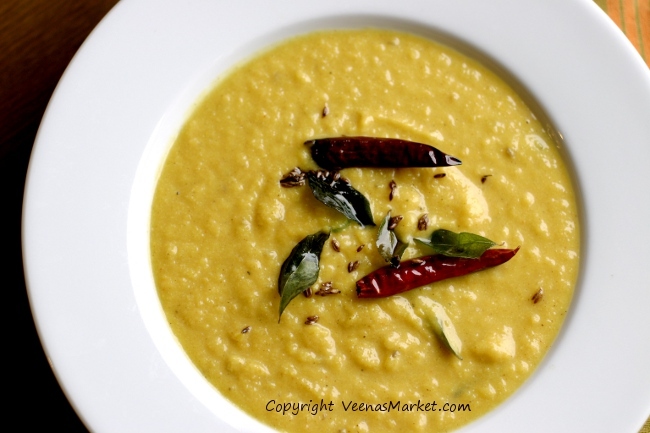 Add the curry leaves, urud dal and chilies and stir constantly to prevent from burning. Saute for just 10 seconds. Add onion and sauté till soft translucent. Mix in the veggies and turmeric. Cook for 2 minutes. Stir in the water and cover the skillet. The oats should be cooked after about 6 minutes. Stir halfway through. 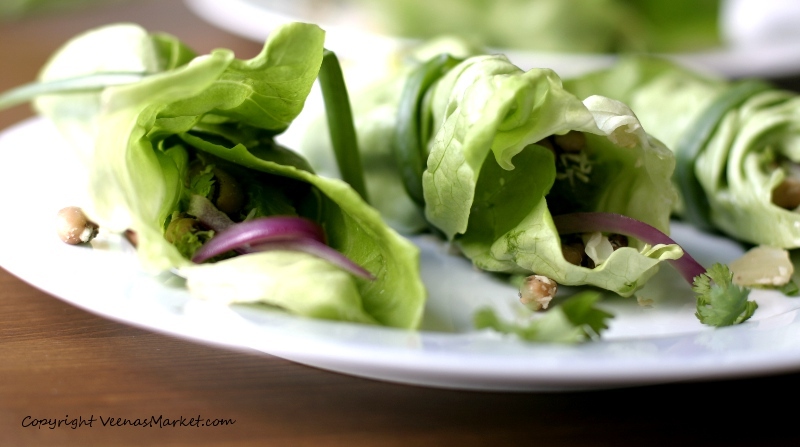 Add salt and squeeze lime to taste. Mix in the grated coconut. Serve hot with yogurt on the side. I made this naan three days in a row. I couldn’t stop. It was so good. Perhaps it was because I haven’t had any regular naan in three months due to food allergies. Or perhaps it was the thin slices of spring shallots from the farmers market that made them so flavorful. Whatever it was, they were naanresistable. What was that? Too many naansensical puns? OK OK I’ll stop. But only if you promise to give this recipe a try! If you hadn’t made it yourself, you might not even have realized that they are not made with wheat. Oh by the way, there is also no dairy or yeast. Best of all, this is an instant dough. You don’t need to wait for it to raise. This is starting to sound like an infomercial, isn’t it? But wait, make this naan in the next 24 hours, and you will lose weight. He he. What can I say, I’m just happy to be eating naan again! Mix all the dry ingredients in a large bowl. Stir all the wet ingredients. Now make a well in your flour and pour in the wet ingredients. Knead till you achieve a smooth and soft dough that doesn’t stick to the bowl. A lot depends on the size of the eggs. If you cannot bring the dough together at all, add a couple of tablespoons of warm water and try again. If the dough is too wet, add another tablespoon or two of the gluten free flour. Smear some oil all around the ball of dough also helps to work with it. I also recommend slightly oiling the cutting board, rolling pin and your hands as the dough is quite sticky. Divide the dough into 8 equal portions. These naans are about half the size of the regular ones. Smooth out each ball of dough and flatten in your palms before placing on the board. Roll out gently and stop when you have a 3 inch circle that is about a centimeter thick. This is a good time to sprinkle your toppings on. Continue rolling out gently until you have a 5 inch circle. Instead of rolling it out all the way, I personally found it easier to simply pick up the naan half way and stretch it out like pizza dough by rotating it in the air like a disc. Try it both ways a couple of times and I think you’ll get the hang of it. If your dough is not too stretchy, your flour to egg ratio was slightly too high. Roll out all the naans at least mid way and cover with a slightly damp towel. Spread high heat oil on a cast iron skillet. Heat over medium heat till it just starts smoking. Have some oil on hand as you will need to smear a teaspoon of oil in between batches. Once the skillet is ready, gently lift the naans and place 2-3 or how many ever will fit on the skillet. I like to put the side of the naan down that does not have the toppings. In a few seconds, you should see the bubbles forming. This is a good sign. 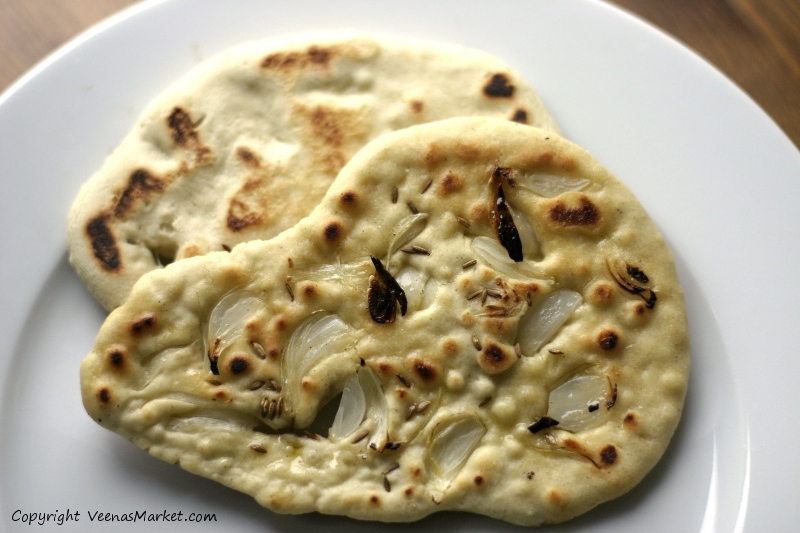 Turn over the naan and let the other side cook when you see a few dark spots. After a few minutes, you might need to lower the heat slightly if your skillet starts smoking too much. 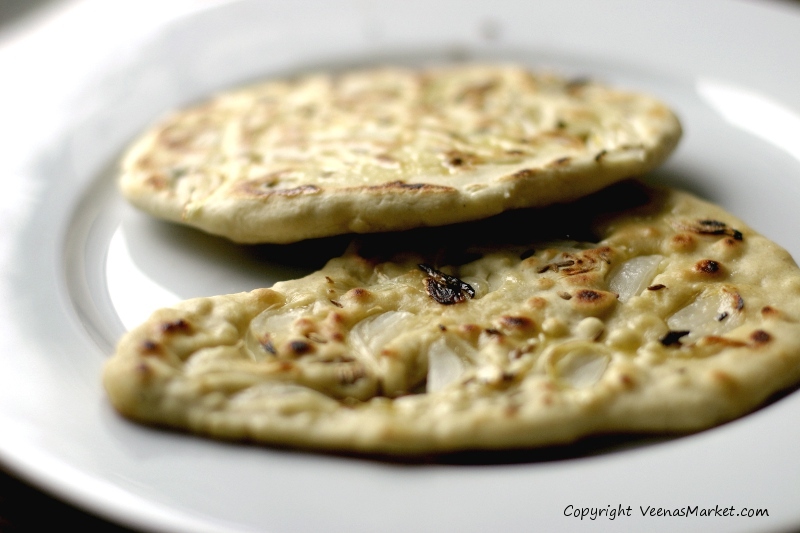 Make all the naan and place in a single layer on a plate and cover. Once all of them are done, smear them with some olive oil, butter or ghee. 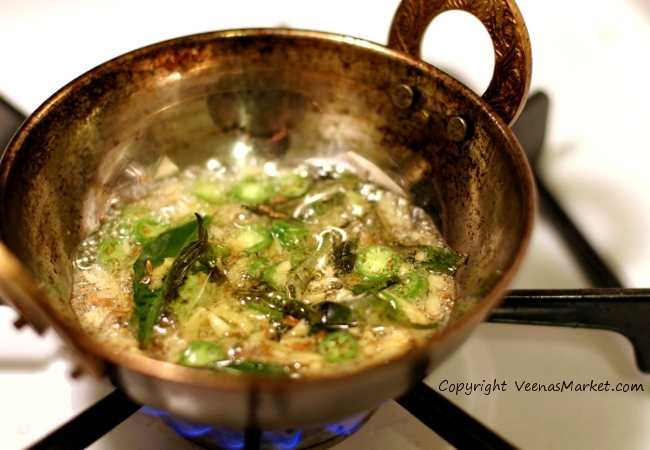 I like to use ghee (clarified butter), since it has great flavor and with the dairy solids removed, I can eat it. 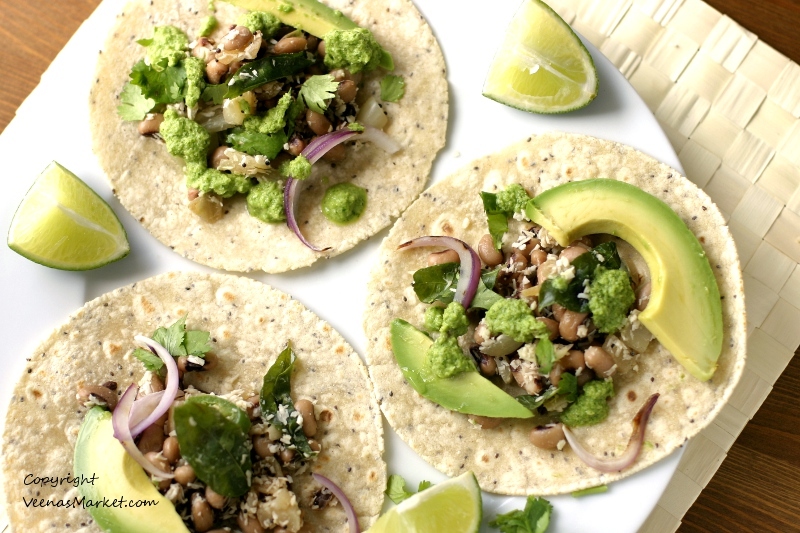 For best consistency, use a cast iron skillet and make sure that it is slightly smoky at all times. I served the naan with just mint chutney once and they were delicious and all gone in 10 minutes. Let me know how this recipe works out for you. And if you took a picture, post it on the facebook page please!